Samsung Galaxy Core Prime Specifications: Galaxy Core prime is the new smartphone listed in the galaxy series. This phone is yet to be launched and its key features are officially announced by the company and this phone is also known as Samsung Galaxy Core Prime SM-G360, SM-G360G with single SIM card slot is known as Samsung SM-G3606, SM-G3608, SM-G3609 with dual SIM card slots. After having a big rival with the apple, the company is now looking forward to release its smart phones among the small mobile companies and core prime is one such device that is being Â a big rivals to the companies mentioned above due to Samsung Galaxy Core Prime Specifications. It is a budget device and for Samsung lovers this phone is a gift from the company for your pocket. To have a more insight in the phone, let us jump toÂ Samsung Galaxy Core Prime Specifications. The new Samsung galaxy core prime dual-SIM phone is loaded with the 1.3 Ghz quad core processor with a Qualcomm Snapdragon 410 SoC with 32- and 64-bit support, four Cortex-A53 cores with a 1.2GHz top clock speed,Â 4.5-inch display, 1 GB of RAM and 8 GB of expandable memory. There is a 5 megapixels, autofocus camera with LED flash on the back, as well as 2 megapixels front shooter for selfies and only 8.6 millimeters thick which Â the GALAXY Grand Prime combines sophistication and powerful performance. The phone runs Android KitKat 4.4 and is powered by 2000 mAh battery better than its rivals. The Samsung Core PrimeÂ offers a giant screen of 4.5 inch WVGA display screen with a resolution 0f 480 x800 pixels which will help you to watch your movies and play games on gigantic HD screen. One of the element that has kept theÂ Xolo o3 in news is the its quad-core Qualcomm Snapdragon processor clocked at a speed of 1.3 GHz coupled with 1 GB of RAM under the hood, the device seems quite good and will surely help in smooth functioning of the phone and will make multi-tasking a cake walk. Core PrimeÂ has 8 GB of internal storage and can be expanded to 64 GB of memory through external microSD card slot. 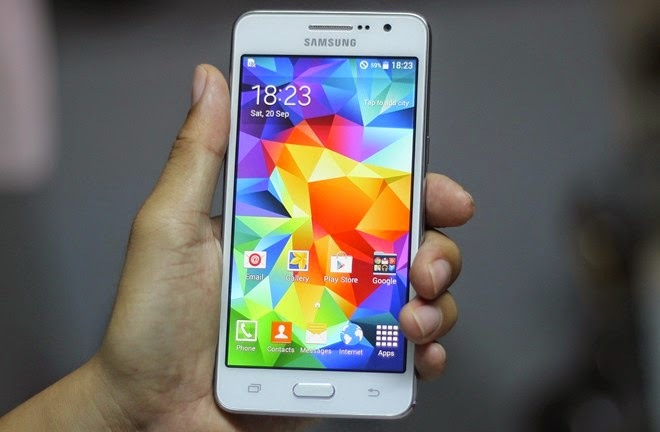 Samsung Galaxy Core PrimeÂ has the only disadvantage or drawback that it operates on Android v 4.4 Kitkat. Its operating system is well outdated Samsung should have launched it with Android v5.0 (Lollipop). Samsung Galaxy PrimeÂ is packed with a 5 megapixel rear camera with LED flash The phone is able to capture close-up shots beautifully.There is a front shooter of 2 megapixel. Samsung promises good front camera for selfie and video calling. The battery of Samsung Core PrimeÂ is 2,000 mAh Li-ion type and offers 10 hours of talktime on 3G and upto 20 hours of talk time on 2G. Samsung Galaxy Core PrimeÂ is available at a price tag of Rs. 8,499 in India and is available at a price of $188 in US. The phone is the latest edition in its Galaxy smartphone series and is clearly a budget smartphone. Techie pocket would recommend Micromax canvas knight, Karbonn sparkle V, MotoE,G.